(a) Check the results obtained in "SYMPTOM CONFIRMATION AND DTC (AND FREEZE FRAME DATA) CHECK". Then find the output DTC in the DTC chart. Look at the "Trouble Area" column for a list of potentially malfunctioning circuits and / or parts. (a) Check the results obtained in "SYMPTOM CONFIRMATION AND DTC (AND FREEZE FRAME DATA) CHECK". Then find the problem symptoms in the problem symptoms table. Look at the "Suspected Area" column for a list of potentially malfunctioning circuits and / or parts. (a) Confirm the malfunctioning circuit or part. (a) After the adjustment, repairs or replacement, confirm that the malfunction no longer exists. If the malfunction does not reoccur, perform a confirmation test under the same conditions and in the same environment as when the malfunction occurred the first time. 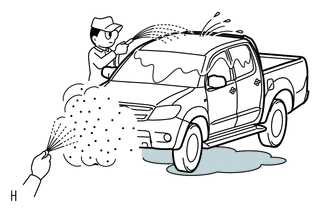 The diagnostic system in the TOYOTA TACOMA has various functions. By using these functions, the problem areas can be narrowed down and troubleshooting is more effective. Diagnostic functions are incorporated in the following system in the TOYOTA TACOMA. In the DTC check, it is very important to determine whether the problem indicated by the DTC is either: 1) still occurring, or 2) occurred in the past but has since returned to normal. In addition, the DTC should be compared to the problem symptom to see if they are related. For this reason, DTCs should be checked before and after confirmation of symptoms (i.e., whether or not problem symptoms exist) to determine current system conditions, as shown in the flowchart below. Never skip the DTC check. Failing to check DTCs may, depending on the case, result in unnecessary troubleshooting for systems operating normally or lead to repairs not related to the problem. Follow the procedures listed in the flowchart in the correct order. In the symptom simulation test, the problem symptoms as well as the problem area or parts must be confirmed. First, narrow down the possible problem circuits according to the symptoms. Then, connect the tester and carry out the symptom simulation test, judging whether the circuit being tested is defective or normal. Also, confirm the problem symptoms at the same time. Refer to the problem symptoms table for each system to narrow down the possible causes. Do not heat to more than 60°C (140°F). Exceeding this temperature may damage components. 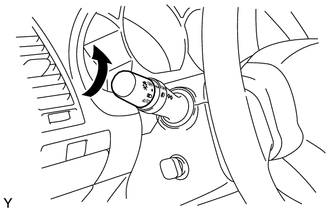 (1) Turn on the heater blower, headlight, rear window defogger and all other electrical loads. Check if the malfunction reoccurs. Look for output Diagnostic Trouble Codes (DTCs) (from the DTC checks) in the appropriate section's Diagnostic Trouble Code Chart. Use the chart to determine the trouble area and the proper inspection procedure. A description of each of the chart's columns is below. Indicates the page where the inspection procedures for each circuit is to be found, or gives instruction for checking and repairs. When a "Normal" code is output during a DTC check but the problem is still occurring, use the Problem Symptoms Table. The suspected areas (circuits or parts) for each problem symptom are in the table. The suspected areas are listed in order of probability. A description of each of the chart's columns is below. In some cases, the problem is not detected by the diagnostic system even though a problem symptom is present. It is possible that the problem is occurring outside the detection range of the diagnostic system, or that the problem is occurring in a completely different system. Indicates the page where the flowchart for each circuit is located. A description of the main areas of each circuit inspection is below. The major role and operation of the circuit and its component parts are explained. Indicates the diagnostic trouble codes, diagnostic trouble code detection conditions, and trouble areas of a problem. This shows a wiring diagram of the circuit. Use this diagram together with ELECTRICAL WIRING DIAGRAM to thoroughly understand the circuit. Use the inspection procedures to determine if the circuit is normal or abnormal. If abnormal, use the inspection procedures to determine whether the problem is located in the sensors, actuators, wire harnesses or ECU. Connections of tester are indicated by (+) or (-) after the terminal name. 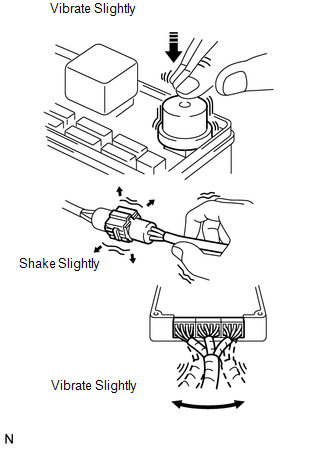 For illustrations of inspections between a connector and body ground, information about the body ground is not shown in the illustration.